The shrimp industry has boomed over the last 20 years as the result of production on large industrial shrimp farms, which have devastating impacts on mangroves as well as causing countless human rights violations against the people who live in and depend on these ecosystems. 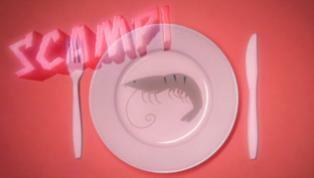 The Swedish Society for Nature Conservation (SSNC) launched the Anti-Scampi campaign (scampi is a term used to refer to large shrimp or prawns) in 2011 with the goal of influencing a change in the consumption of shrimp in Sweden. To give a new twist to the campaign, the SSNC decided to try to raise awareness through a short and straightforward but entertaining “infomercial” that was launched from the new campaign website, www.antiscampi.se, with a bit of extra help from a number of influential bloggers who had been recruited to the campaign. So far, the Swedish version of the short video has received more than 115,000 views on YouTube, while the English version (Keep tiger prawns off your plate,http://www.youtube.com/watch?v=kw0tkYK7oEM&list=PL20325D34102EA53B&index=6) has received almost 22,000 views. The Spanish version (Langostinos fuera del plato,http://www.youtube.com/watch?v=fPD5xQ-SGLw), uploaded in December 2012, has already been viewed 2,300 times, Kajsa reported. The video was subsequently broadcast pro bono on a number of commercial television networks. The SSNC campaign site on Facebook quickly reached more than 10,000 people. (http://www.naturskyddsforeningen.se/sites/default/files/dokument-media/murky_waters.pdf), as well as a film with the same name (http://www.youtube.com/watch?v=hPJpPEH3l7o), and with the report “Do You Know What Your Dinner Ate for Breakfast” on the production of fish meal for use as feed for shrimp farms (http://www.naturskyddsforeningen.se/sites/default/files/dokument-media/do_you_know_what_your_dinner_ate_for_breakfast.pdf). The report and the videos reached a large audience, the videos being broadcast in peak viewing hours in the Swedish media and elsewhere (such as the U.S. satellite television network Link TV). During 2012, the campaign inspired NGOs in Norway and Spain to organize their own campaigns against the consumption of farmed tropical shrimp. • Four of the five main retail supermarket chains in Sweden have stopped selling tiger prawns. • The same has been done by the International Society of Restaurants, hotel chains and a long list of restaurants. • Some companies have not only stopped selling farmed shrimp or prawns, but have also helped to share information and raise awareness about the environmental problems they cause. • The campaign has initiated a public movement for the dissemination of information to restaurants and supermarkets. • The public movement is committed to the cause and works to spread the SSNC’s messages both online and offline, in restaurants and supermarkets. • A significant decrease in tiger prawn consumption has been observed, at the local level and among wholesalers who have stopped selling shrimp. • The campaign has also been endorsed by nationally and internationally renowned chefs and TV personalities.